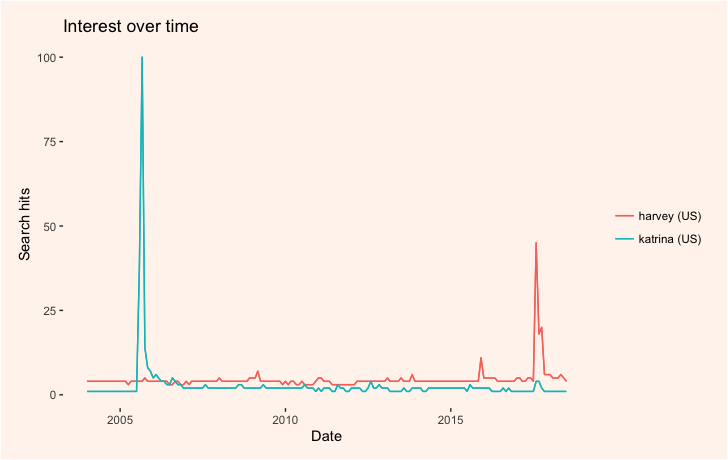 Let’s first look at how the impact of hurricanes Katrina (August 2005) and Harvey (August 2017) are reflected in how Americans have used these names as google search items over time. We’ll also add change some of the plot settings by creating our own ggplot theme. The gprop argument controls whether we want general web, news, image or Youtube searches. The time argument is set to “all” and will gather data between 2004 and the time the code is run. Focusing on searches made in the U.S., we’ll set the geo argument to “US.” The glimpse() function will summarize the results stored in hurricanes. 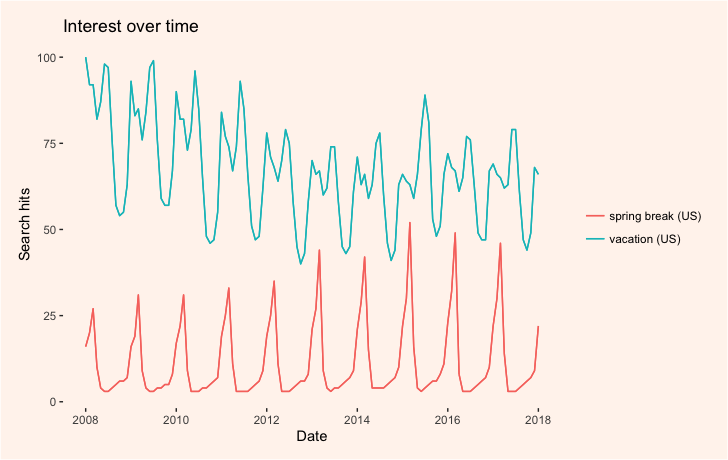 Plot the output using plot(). The above plot shows clear spikes around the time when Katrina and Harvey hit the U.S. To understand what is actually measured on the y-axis, have a look here. We could also plot more cyclical data. As you can see in the output below, the gtrends function actually returns a list of data frames with various kinds of data. There's a lot of data here we can plot. .. .. ..- attr(*, "v.names")= chr "value"
.. .. ..- attr(*, "times")= chr "top"
.. ..$ v.names: chr "value"
.. ..$ idvar  : chr "id"
.. ..$ timevar: chr "related_queries"
- attr(*, "class")= chr [1:2] "gtrends" "list"
Now, let’s compare the amount of interest in Hurricane Harvey for each U.S. state. 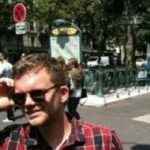 Why don't we take a look at our new dataframe using harveyMerged %>% dplyr::glimpse(78)? 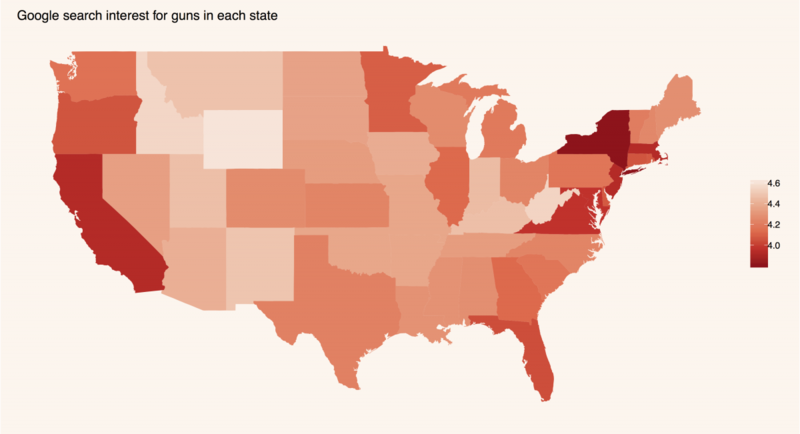 With statesMap, we fetch an empty map for plotting our geographical data. 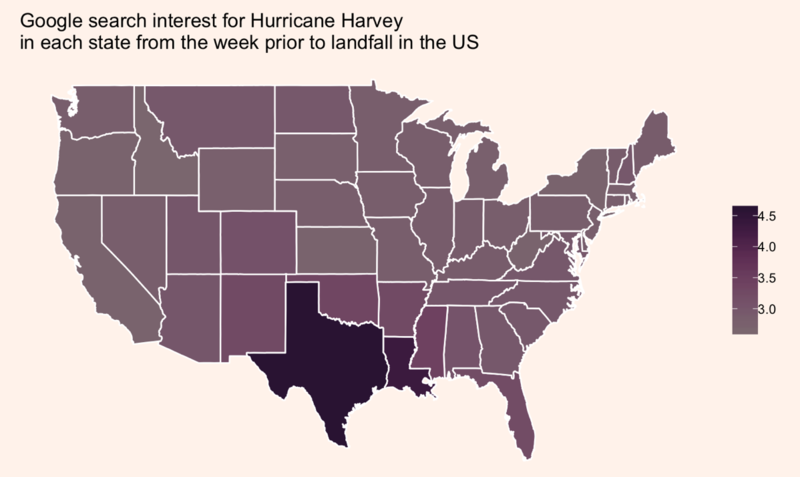 With harveyMerged, we merge our Google Trends data with the underlying map data. Both datasets contain a column called “region” which will be used to merge the data frames. Note that the region labels need to be identical. Therefore we change the capitalized state names to lowercase using the stringr function. Now we can plot the data! But first we’ll modify our ggplot theme for plotting maps. Note that we have plotted the log-transformed hits variable. Take the tutorial for a spin yourself! What other Google Trends searches might you want to map? Here's a map of "guns" searches. Ed note: Thanks to Martin Frigaard for "tidyverseifying" this post.